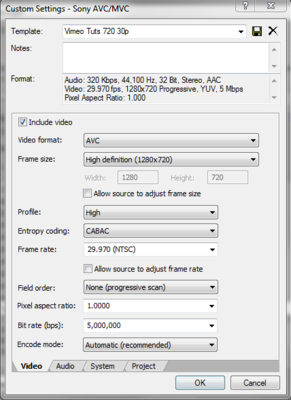 I'm having a problem with image quality loss when rendering files from a Panasonic TM900 to .MP4 using Sony Vegas Pro 11. The camera shoots in 1080\60p and saves as an .MTS file. 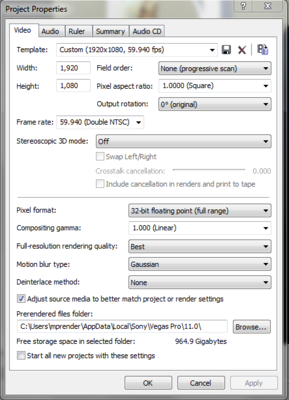 The file links are for the project settings used, the rendering settings, and the output. 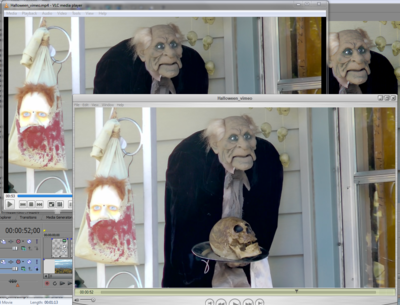 The original video image (top) and the rendered image (bottom). I matched the project settings to the input files (.avi). Does anyone have advice for what settings to change so that the image quality is retained better? My workflow is to take the .MTS file and convert it to .AVI with Cineform and then edit the .AVI file in sony vegas pro and output to .MP4 at 1280x720p. The original file is 1080/60p. 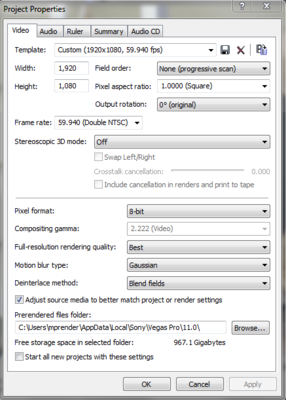 The same problem appears if i use the original .MTS and skip the Cineform conversion so that is not the problem. Jan, Your suggestions appears to have solved my problem. I'll have to recreate the project since changing the pixel format to 32bit crashes Vegas unless i start a new project and change the setting inside the new project. Also the constant bit rate won't render unless set from a new project. not sure what is going on there. Thanks for the help. I'll post a follow up when i redo the entire video and it works. Vegas 10 works better, but projects from 11 (buggy edition) won't open in 10, it seems. You won't get a smooth quality playback, but is guess this is not that necessary. The attached images are so small, it's difficult to figure out what you're referring to. How would you describe the "low quality" that you're concerned about? Please be more specific. One thing I do see in the Output image is that black is incorrectly mapped. It's more concerned with too much contrast, but the underlying luma space conversions are something you need to look at. Thanks for the reply Seth. I was not able to solve my problem with the suggestions from Jan as i first thought. I've attached some images here that you can hopefully view better. The problem i have is the image quality is degraded. See the difference in the attached file. Image near top of picture is from the Vegas Video Preview and lower image is from a render file. 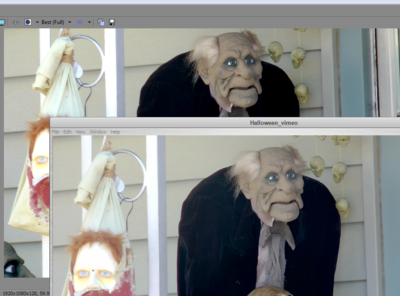 Note the fine detail in the face on the source image and much lower quality of the rendered file (halloween_vimeo). Thanks for the link on levels. I don't understand how you know that black is not mapped correctly. How do i see what value it is in my image? 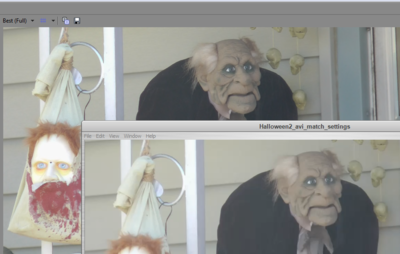 Can you point me to a good source to learn how to understand color correction? or explain it? I read the info at the link you provided but it didn't help me understand what is not correct in my image. Thanks for taking the time to help me out. This is indeed a big difference in quality. 2. 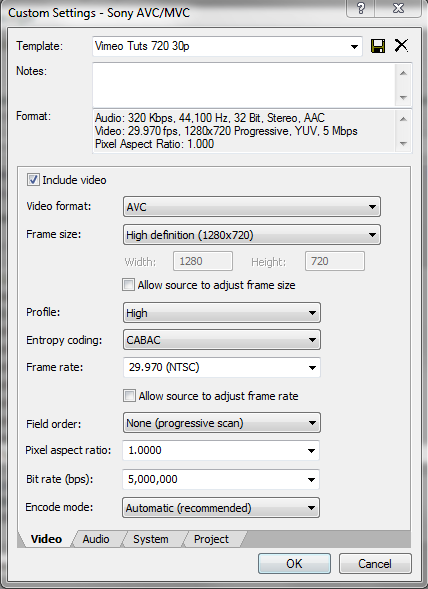 You render your movie to a bitrate of 5000.....this is very low imho....why not + 10000. 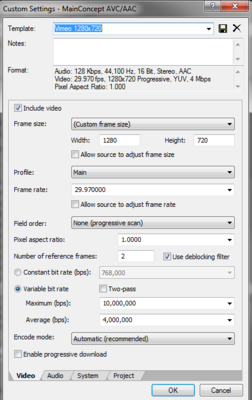 Lower bitrates do reduce image quality. 3. I see you play your rendered movie in a quicktime player (if i am right), could it be it does not play it at the right colors? The difference is too much, cannot believe this has something to do with vegas. Can you test the rendered movie in another kind of movie-player, compare this quality with the movie in your original first player. Jan, VLC player does do a better job. See attached comparison. Vegas viewer is upper right, VLC left, and QT bottom. There is still more loss than i'd expect in the image but it is better. Any further thoughts? Now if you the compare the vegas preview with vlc? What's the result? Jan, You can see the Vegas and VLC comparision in my last image. Vegas on the right and VLC on the left. Still some degraded quality.